So much goes into the perfect vacation: lodging, ground transportation, activities, and tours. 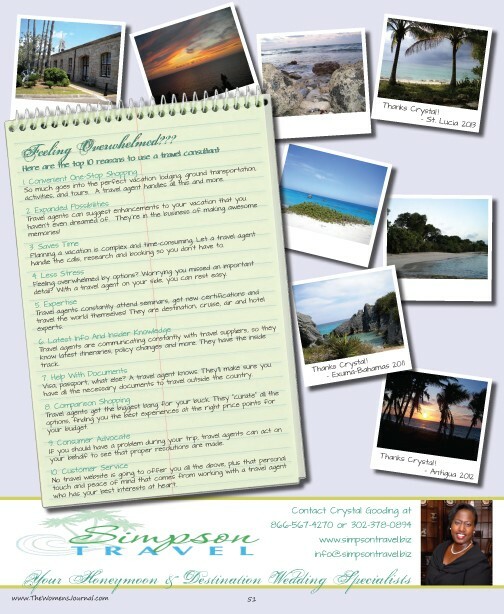 A travel agent handles all this and more. Travel agents can suggest enhancements to your vacation that you haven’t even dreamed of. They’re in the business of making awesome memories! Planning a vacation is complex and time-consuming. Let a travel agent handle the calls, research and booking so you don’t have to. Feeling overwhelmed by options? Worrying you missed an important detail? With a travel agent on your side, you can rest easy. Travel agents constantly attend seminars, get new certifications and travel the world themselves! They are destination, cruise, air and hotel experts. Travel agents are communicating constantly with travel suppliers, so they know latest itineraries, policy changes and more. They have the inside track. Visa, passport, what else? A travel agent knows. They’ll make sure you have all the necessary documents to travel outside the country. Travel agents get the biggest bang for your buck. They “curate” all the options, finding you the best experiences at the right price points for your budget. If you should have a problem during your trip, travel agents can act on your behalf to see that proper resolutions are made. No travel website is going to offer you all the above, plus that personal touch and peace of mind that comes from working with a travel agent who has your best interests at heart.